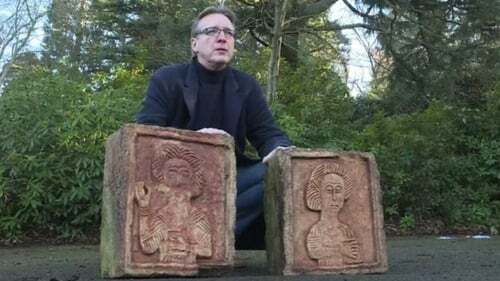 A Dutch art detective has returned two priceless stone reliefs stolen from an ancient Spanish church after tracing them to an English aristocrat's garden where they were displayed as ornaments. Arthur Brand, dubbed the "Indiana Jones of the art world", said he handed over the centuries-old carvings to the Spanish Embassy in London at a private ceremony yesterday. They turned up in the garden of an aristocratic British family who had unwittingly bought them, and it was there that Mr Brand found them covered in mud and leaves. "These artworks are priceless. To find them in a garden after searching for eight years is just incredible," Mr Brand told AFP. The reliefs, said to weigh 50kg (110lbs) each, were then handed to representatives of Spain's Guardia Civil police force, who are collaborating in the case, and two museum curators from the northern city of Burgos. But in a huge blow the reliefs were snatched by professional art thieves in 2004, Mr Brand said. In 2010, Mr Brand first received word from an unnamed British informant that "something strange" had popped up in London, which eventually pointed him to a shadowy man Mr Brand referred to as 'Mr X'. "It turns out 'Mr X' saw a French dealer arriving with the reliefs by truck in London. They were put on offer as garden ornaments - but Mr X recognised them as possible Visigoth religious artworks," Mr Brand said. "The guys who stole these wanted to sell it for a couple of millions or whatever, but they have soon find out that you cannot sell these, so to make at least a little bit of money, they sold them as garden ornaments," he said, adding that they were probably sold for around £50,000 pounds each. Mr Brand then tracked down the French dealer, who pointed them towards an unnamed British aristocratic family living north of London. The owners were so shocked when told the truth that "they wanted to throw the artworks into a river and let them disappear forever. Fortunately we managed to convinced them not to," said Mr Brand. It was yet another success for Mr Brand, who was in the headlines last year for returning a stolen 1,600-year-old mosaic to Cyprus that was found in the possession of a similarly unwitting British family.